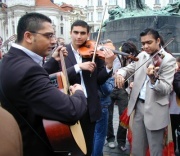 The jubilee tenth Annual KHAMORO World Roma Festival will be held between 25th and 31st May 3008 under the patronage of Mirek Topolánek, Prime Minister of the Czech Government, and Pavel Bém, Mayor of Prague. The tenth year of the festival is a prominent anniversary and so we are glad to be able to present fans with the Khamoro All Stars, a selection of the very best acts to have appeared over the past ten years. We are also delighted to be able to extend the festival by an extra day. 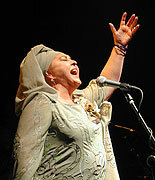 The festival is being organised by the Slovo 21 unincorporated association. 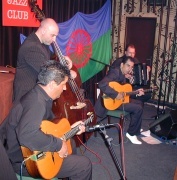 The festival gets underway on Sunday 25th May in the Rock Café club with concerts by Guločar and Le čhavendar, combining traditional Roma music with elements of funk and Latino. On Monday you can look forward to the opening of an exhibition entitled “Ztracený ráj” (Paradise lost) at Museum Kampa, which will provide a platform to contemporary Roma artists from around the world. 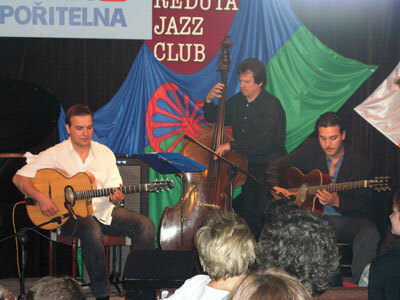 The Gypsy Jazz series of concerts then get underway at the Reduta jazz club with a performance by French virtuoso Yorgui Loeffler. The tremendous programme on Tuesday 27th May allows you to choose from a viewing of pictures by German artist Alfred Ullrich at Dům národnostních menšin (National Minorities House) or the start of a film marathon at the Aero cinema accompanied by a live performance from popular band Gitans. The Gypsy Jazz concerts continue in the evening with a performance by the outstanding Angelo Debarre from France. The programme begins on Wednesday with a viewing of black and white photographs by currently the most prominent Czech expert on Roma issues Eva Davidová at the Popocafépetl club, accompanied by a performance by Cinzi Renta, a band from Český Krumlov. The film marathon continues in the Aero cinema at 6 p.m. and the three-day series of Gypsy Jazz concerts comes to a close with a performance by Dutch group Basily, which starts at 9 p.m. The traditional parade of participants from Můstek to Staroměstské náměstí (Old Town Square) gets the programme of events underway at midday on Thursday 29th May. An exhibition of Roma national dress opens at Palace Aventin in the afternoon in cooperation with the Museum of Roma Culture. Stars such as Esma Redžepova from Macedonia and the captivating Puerto Flamenco from Spain will take to the stage of the Roxy club from 7 p.m. for the first concert of traditional music alongside a performance of music and drama by Ukrainian group Romans and an appearance by the legendary Czech band Bengas in its original line up. Flamenco dance workshops at the Zambra Studio also begin on Friday, taken by Francesca Grima from Puerto Flamenco herself! The second concert at the Roxy club sees performances by one of the best Balkan orchestras of all, Oluja from Serbia, king of the clarinet Ferus from Macedonia, Russian legend Loyko and Arbat from France. The closing gala concert will be staged on Saturday 31st May at the Congress Centre, where all 8 groups from the previous two days will appear. This four-hour concert will allow you to hear the very best of Roma and Balkan music accompanied by special stage management and lights. 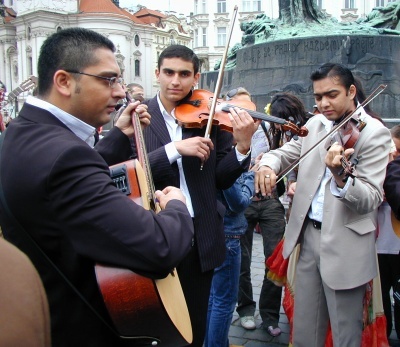 The international ethnomusicology conference entitled “Hudba a menšiny” (Music and Minorities) will run throughout the festival in cooperation with Charles’ University and will be attended by 100 of the most prominent ethnomusicologists from throughout the world. Almost 100 artists from 8 countries will appear at the festival and experts from at least 40 countries will attend the ethnomusicology conference. Fans and journalists from around the world come to the festival every year. The festival is being jointly organised by the City of Prague and will take place with the support of the Ministry of Culture of the Czech Republic, the ČEZ Foundation and Sgroup. The main media partner to the festival is Czech Television. Other media partners are Czech Radio, Radio 1, Romea.cz, Romano Hangos and Radio Rota.